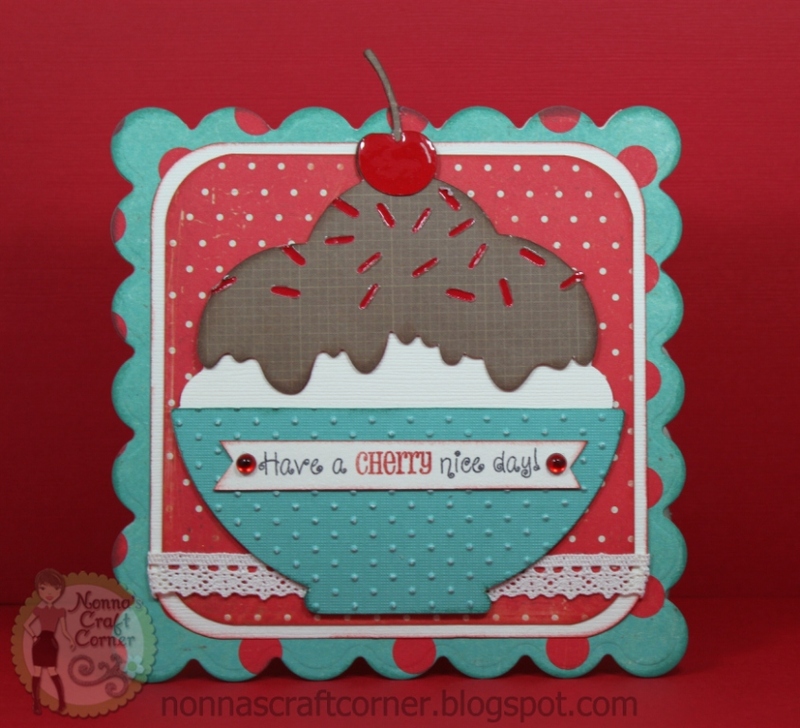 Studio 5380: Have a CHERRY nice day! 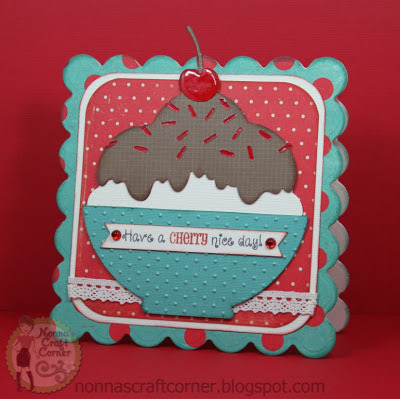 * Card base - created with Spellbinders Grand Nestabilities - "Grand Scalloped Squares"
* Ice cream - Cricut's "Sweet Shop" cartridge. I hand cut my banner and inked up the edges a bit. Then added some red gems for a bit of bling. Hope you enjoyed my sweet card! Before I go, I want to remind you that if you have not already left a comment on my Valentine Give-Away post, you still have time! I will be drawing the winning name this Wednesday. If you missed the post, you can see it by clicking here. this is so super adorable Tanya! LOVE the shape and the cute cute ice cream! And that sentiment....adorable! I have this set on my wishlist!!! Now that looks yummy! Really cute card!! Tanya ~ Oh what a GREAT way to start my week off ~ something so YUMMY to look at!! So PRETTY and I LOVE this color combination ~ so use it as often as you want! LOL!!! LOVE all the shiny elements too! I have to take a look at these stamps ~ just need to get off my craft starvation diet soon!! Have a wonderful evening!!! Seriously, your making me hungry!!! 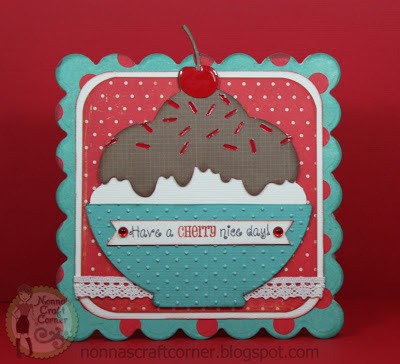 What a SWEET and delicious lookin' card:) So fun Tanya! What a GREAT card!!! :) I love that color combo, too! How did you stamp the sentiment in black & red (did you color the whole thing with markers or did you mask it)? Oh, I am so in love with the new Peachy Keen Stamps...I LOVE that Kathy offers matching SVG's!!!! Yummy Yummy and I am so ready for a midnight snack now, lol. Love this. Great color combo. Looks good enough to eat. The embossing is such a nice touch! What a sweet card. I love it. Thanks so much for sharing. I have the sweet shop cart and have never used. I will now. I'm not tired of the red and blue. Great colour combination. 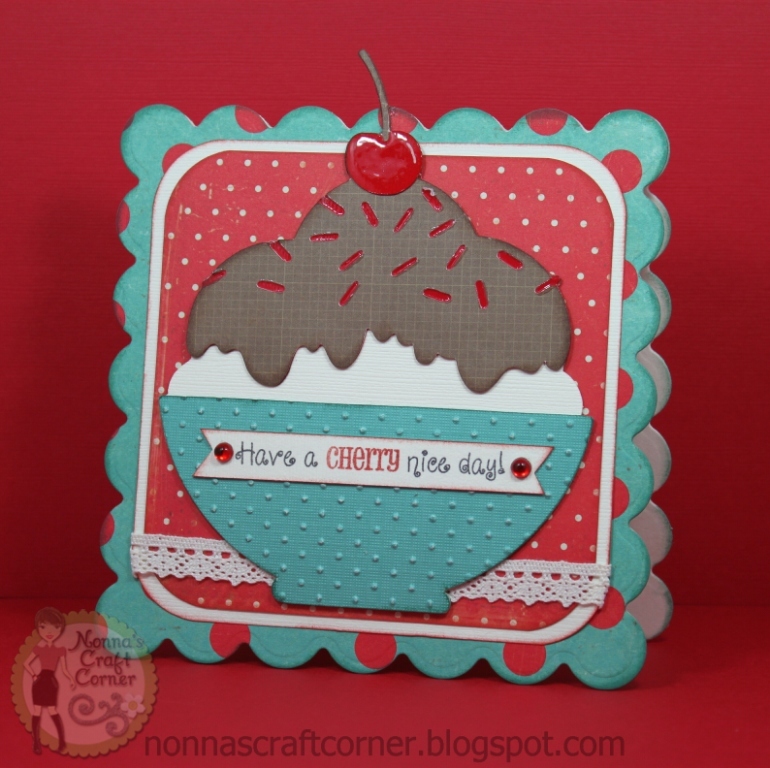 super cute card, makes me want ice cream, love that blue paper, where do you get it at. What a super sweet card! I love the color combo and the glossy accents on the sprinkles and cherry was such an awesome touch! Thanks so much for joining us at Pause Dream Enjoy Challenges! Like the shaped card with sprinkles and use of glossy accents. Thanks for entering PDE Desserts challenge. Love this Adorable,Yummy and Cool shaped card!